The Craftsman style was a part of the Arts and Crafts Movement that began in the 1880’s and includes the Bungalow, Prairie, Mission, Pueblo, Four Square, and Western Stick styles. Although it is sometimes referred to as “Bungalow” or “Arts and Craft” style architecture, a bungalow is a type of building and not a style. Bungalows were originally created to protect people from the sun in warmer climates. The style gained popularity in the United States during the 1940’s and 1950’s before air conditioning was available. During the Arts and Crafts era, a group of architects and designers working in California adopted a “back-to-nature” attitude that stemmed from a strong dislike for the excessive ornamentation and machine-made features characteristic of the Victorian era. The Craftsman style movement celebrated simplicity, championing the efforts of craftsmen who meticulously worked with their hands to build structures using natural construction materials. Architect and furniture designer Gustav Stickley’s publication of The Craftsman in 1901 assigned a name to the emerging style. Over time, the Craftsman style gained popularity among the middle-class between 1910 and 1930. Manufacturers, including Sears & Roebuck, advertised precut houses in mail order catalogs. Apart from the foundation, well, and septic system, all of the materials needed to build a craftsman style house were shipped by train to people across the United States during this era. Baker, John Milnes. American House Styles: A Concise Guide. New York: W.W. Norton, 1994. Print. Pages 114-115. Massey, James C., and Shirley Maxwell. House Styles in America. New York, NY: Penguin Studio, 1996. Print. Pages 190-196. McAlester, Virginia, and A. Lee McAlester. 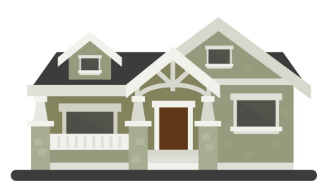 A Field Guide to American Houses. New York: Knopf, 1984. Print. Pages 452-463. Van Buren, Maurie. House Styles at a Glance. Atlanta, GA: Longstreet Pr., 1991. Print. Pages 102-103. Walker, Lester. American Shelter: An Illustrated Encyclopedia of the American Home. Woodstock, NY: Overlook, 1981. Print. Pages 180-191.